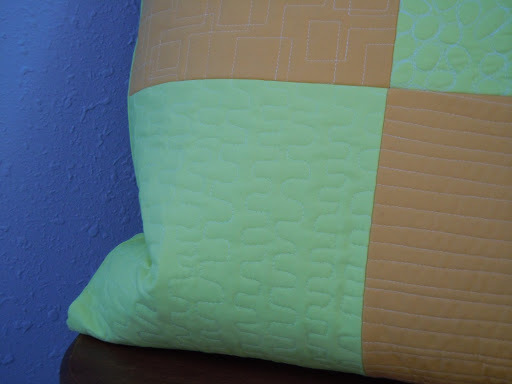 I used the same technique as the creeper pillows: ironing 2 1/2″ squares onto fusible interfacing, sewing 1/4″ seams vertically and horizontally, then adding a 3″ border to make the front. All fabrics used are Kona solids. I am done with squares for a while! Minecraft is still with us! 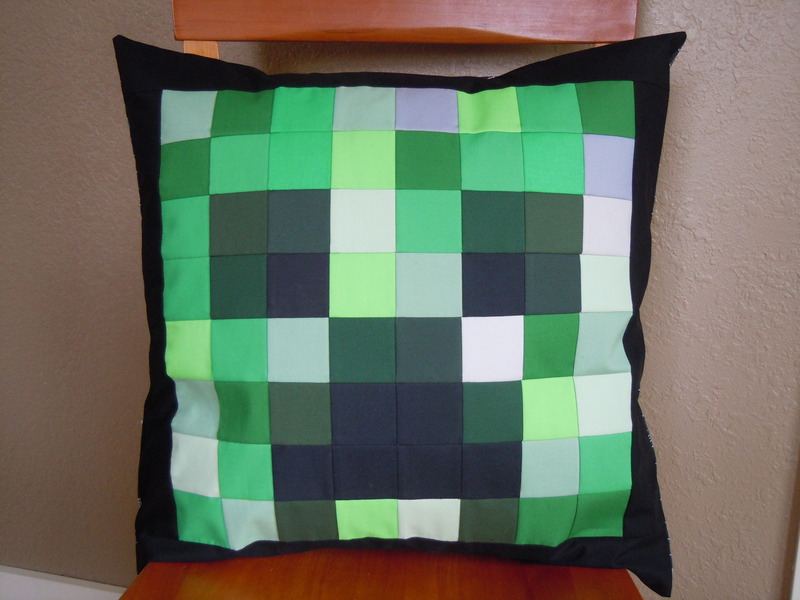 Since every boy of a certain age at my son’s school seems to be obsessed with Minecraft, I decided to make a Creeper pillow for our annual auction on March 15th. Hope it brings in a few bids! 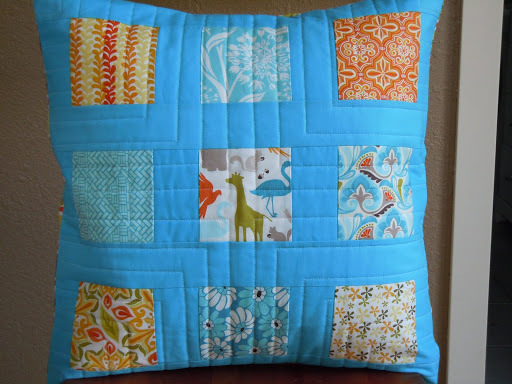 The finished pillow measures 22″ x 22″ with 2″ squares. 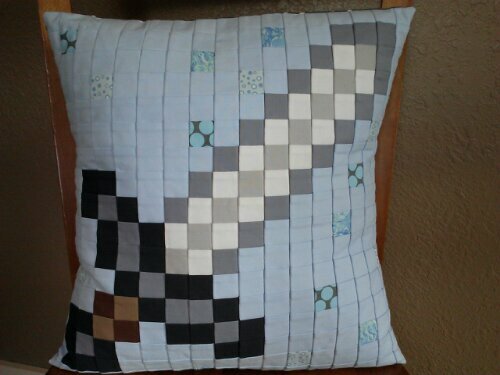 It’s not as ambitious (meaning fewer and bigger squares) as the Minecraft sword pillow I made my son for Christmas, but I am pleased with the results! 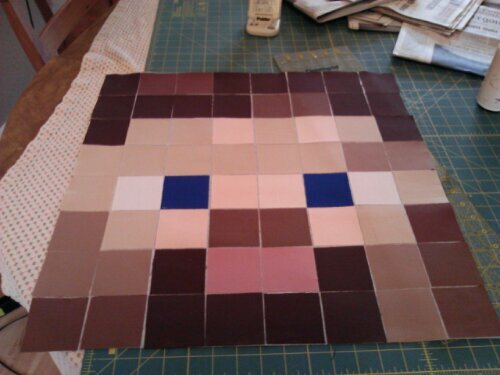 I used a variety of Kona solids for the squares and then added a border to define the creeper a little more. It is backed with Fences Smoke from Summersville Spring designed by Lucie Summers for Moda available at Sew, Mama, Sew! 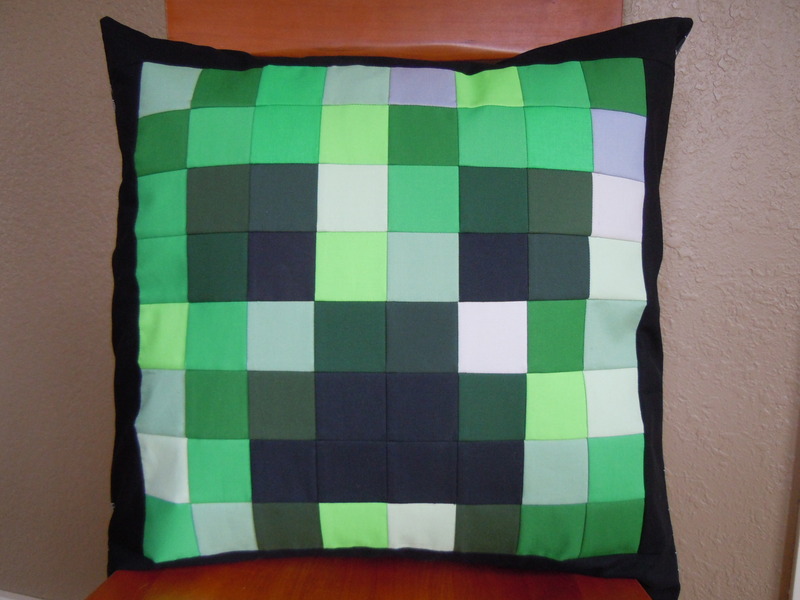 Here’s a pillow I made my son for Christmas. I always like to make him at least one handmade present each year. Like most 8-year old boys, he’s obsessed with Minecraft. I don’t get the allure, but it did inspire this creation. Pixelated worlds just lend themselves to patchwork and quilting! The pillow top is made from 1 1/2″ squares ironed onto lightweight fusible interfacing. 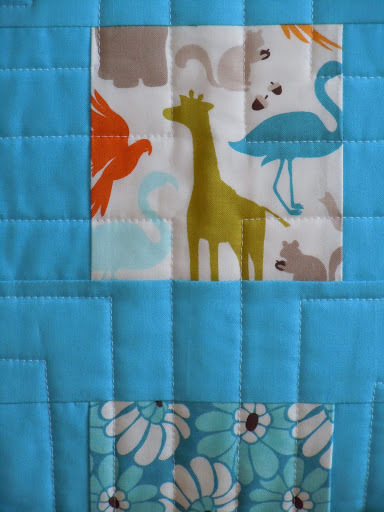 Then seams are sewn vertically and then horizontally leaving you will 1″ squares. This is a great technique for making a messy job look neat. I used mostly Kona cottons for the actual sword with a few prints thrown in the background just to break up the blue. It was a big hit on Christmas morning! I made these pillows as a gift for Teacher Appreciation Week at Southwest Charter School. Asher’s classroom has a wooden bench that the kids like to lay on during read-aloud. These helped to make things a little more cozy. I used a charm pack of Kate Spain‘s Central Park and some Kona solids. I used an echo quilting design. They were a big hit with the kids and Asher’s teacher. Here are the two pillows for Asher’s class. 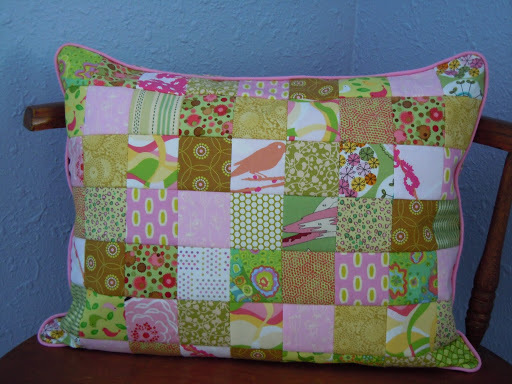 A rectangular patchwork pillow based on Posie Gets Cozy’s Summerhouse Pillow tutorial. I just love making these. I have so many 2 1/2″ squares cut out from scraps. It is so much fun putting the fabrics together. I know they are a little crazy and probably wouldn’t go with anyone’s decor, but I like them. Maybe I should try and add some solids? 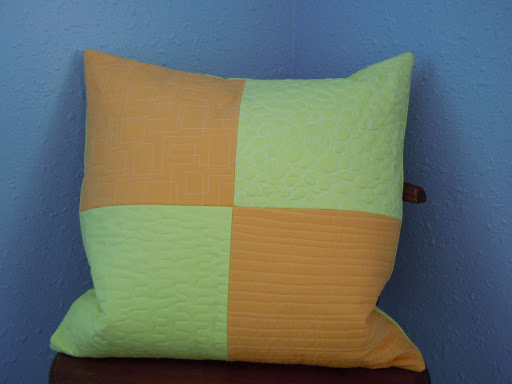 Here’s the pillow I completed from a class I took a while back with Elizabeth Hartman at Modern Domestic. 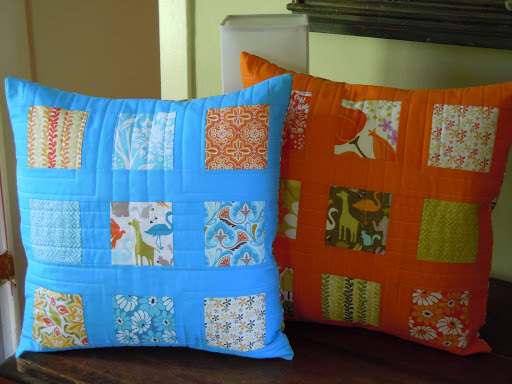 I especially liked quilting the retro-mod squares pattern in the top orange square. 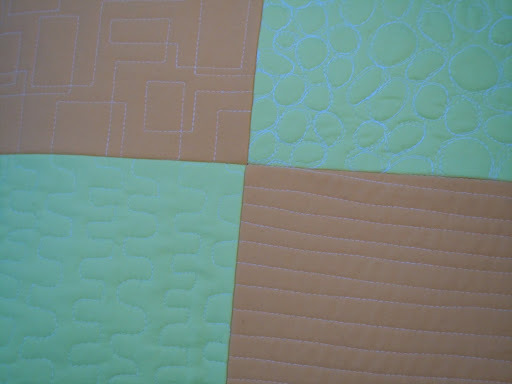 The free-motion quilting (with the little circles) definitely takes some practice. I can’t wait to try these techniques on a small quilt I recently started. Puplandia! Postponed Due to Weather!